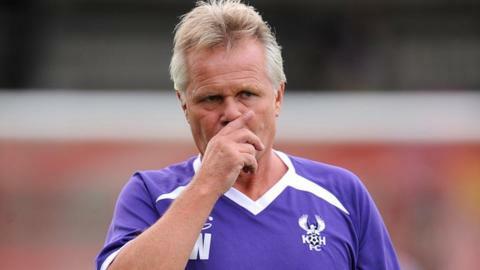 Kidderminster Harriers manager Gary Whild wants his players "busting a gut" after three successive home defeats threatened to derail their season. Harriers' 1-0 FA Trophy second-round exit at home to Altrincham on Saturday came after league defeats by Southport and Forest Green. at Aggbrough. "I want to see us busting a gut, week-in, week-out," Whild told BBC Hereford & Worcester. "If some of them don't want to be part of that, we'll have to change things." Harriers' downturn in form, after a run of four straight wins (including the Trophy first-round win at Bradford Park Avenue) has dropped them back outside the Conference play-off zone. Gary Whild became Kidderminster Harriers' third manager of 2014 when he took charge of the Conference Premier club on 5 March. Steve Burr was sacked on 7 January - just three days after holding League One side Peterborough United to a draw in the FA Cup. Andy Thorn was appointed as successor, but lasted only two months before Whild, Burr's former number two, was brought back from gardening leave. "We're not happy just to say we're fifth or sixth. We want to do as well as we can," said Whild. "Irrespective of the financial situation, we're in the top six. Perhaps this year we've overachieved a little bit but that doesn't matter to me - I want to push on again. "The likes of Keyon Reffell, Akwasi Asante, Jamie Spencer and Jordan Tunnicliffe have come into this football club not because they're on high wages, but because they're hungry to do well for themselves. "They're going out there running around like lunatics, trying their best and busting their gut. I don't see that with some of the other players. Maybe it's time we need to go down that road and liven things up a bit." Harriers had another youngster, on-loan Birmingham City defender Nat Kelly, making his debut after signing on Friday. And although considered at fault for Alty's 19th-minute winner from Damien Reeves, the teenager was backed by Whild. "I thought Kelly got better as the game went on," said Whild. "He's made a misjudgement but I'm disappointed that one ball has beaten all of my back four and their guy has tucked it into the net."